New Delhi, March 21: Bharatiya Janata Party on Thursday released the first list of 182 candidates for the upcoming Lok Sabha Elections 2019. 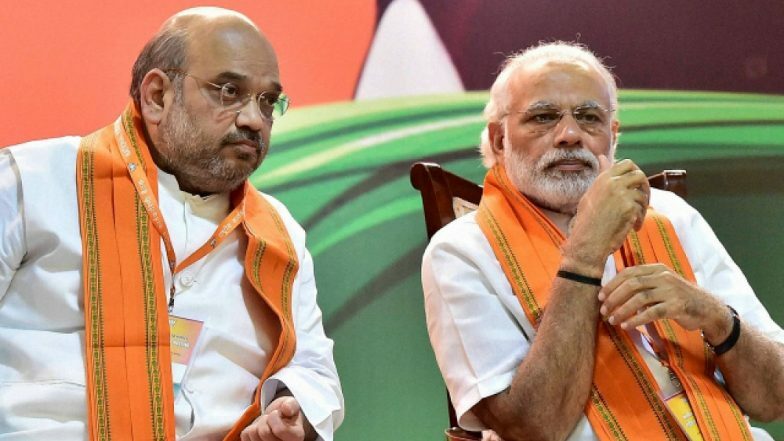 In the first list, announced by Union Minister Jai Prakash Nadda, Prime Minister Narendra Modi has been given the ticket from Varanasi once again, while party president Amit Shah would contest from Gandhinagar seat this time. Among other Union Ministers’ names, that featured in the list include –Smriti Irani (Amethi), K Alphons (Ernakulam), Babul Supriyo (Asansol), Jitendra Singh (Udhampur), Rajnath Singh (Lucknow), Nitin Jairam Gadkari (Nagpur), Arjun Singh Meghwal (Bikaner), Pon Radhakrishnan (Kanyakumari) and Kiren Rijuju (Arunachal West). BJP 1st List of Candidates For Lok Sabha Elections 2019 Out: Narendra Modi, Amit Shah, Rajnath Singh Among 184 Candidates Named; Check Constituency-Wise Here. Revealing the names of the candidates, Union Minister Nadda said, “We have named 184 candidates which were finalised in the CEC meeting attended by our Prime Minister, BJP president, (Home Minister) Rajnath Singh ji and (External Affairs Minister) Sushma Swaraj.” The list, however, does not include BJP veteran Lal Krishna Advani, who is currently the lawmaker from Gandhinagar. The BJP list comes a day after the Congress released its sixth list for the general elections. Unlike the ruling regime, the principal Opposition party is finalising and revealing a fewer number of candidates per list. So far, they have revealed their aspirants from a total of 146 constituencies.